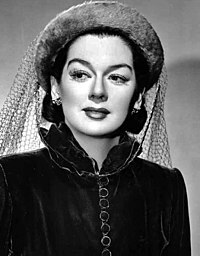 Ba bhan-aisteoir Meiriceánach í Catherine Rosalind Russell (4 Meitheamh, 1907 – 28 Samhain, 1976). Bhuaigh sí an gradam Ban-Aisteoir is Fearr sna gradaim Golden Globe i 1947 agus i 1948 agus an gradam Ban-aisteoir is Fearr i gCoiméide nó Ceoldráma i 1959. Tugadh an leathanach seo cothrom le dáta an 8 Eanáir 2019 ag 01:00.